One of my bookish resolutions for 2017 when it comes to blogging is to focus less on book reviews and more on other posts like regularly participating in „Top 10 Tuesday“, looking at new book releases and just in general to be a bit more creative when writing blog posts. I also want to be more active in the book blogging community and interact more with other readers and bloggers and that’s why I decided to participate in the „2017 Discussion Challenge“ for the first time this year. 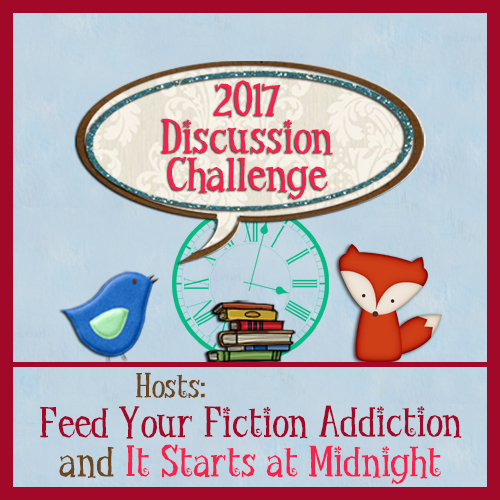 This challenge is hosted by Nicole @ Feed Your Fiction Addiciton and Shannon @ It Starts at Midnight and is supposed to help those who want to participate more in bookish discussions and even start their own and I hope that for me it will be a good motivation to reach at least one of my blogging goals in 2017. I’m planning to write one discussion post per month so that I’m aiming for „Creative Conversationalist“ and to help me reach this goal I will team up with Maraia @ Lettuce Reads. There will also be an extra page dedicated to the Discussion Challenge where you can keep track of all our discussions and everything else challenge-related. If you want to sign up for the Discussion Challenge, too, you can find all information on either Nicole’s or Shannon’s blog. I just discovered your blog but have to say that I am feeling the same way. I spent my first few months of blogging focused on getting my reviews archived and sorted out and realize that the fun of blogging is in the discussions and the comments and not so much the reading of reviews (though I do enjoy them too). I’m going to focus less on the reviewing side and more on the chatting side. I often feel like I’m writing the reviews mostly for myself because to be honest they usually don’t get a lot of views or even comments. I for myself like reading reviews but I usually read them after I’ve read the book by myself to avoid spoilers and to form my own opinion before I get influenced by other ones too much. Also I feel like writing reviews helps me to memorize the book which is especially helpful if it’s a part of a series, so I don’t want to give it up completely.